Whatever the Need For Speed franchise may sometimes have lacked in quality, it’s more than compensated for in its metronomic turnover. The sixteen years following its 1994 debut yielded no fewer than sixteen games; a somewhat improbable achievement for a series that has only intermittently been party to concerted critical acclaim. 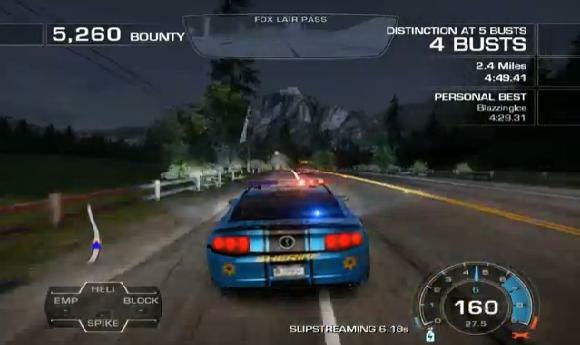 2010’s Hot Pursuit had better prospects than most in its recent history however, because it was being created by a developer of considerable pedigree; Criterion Games, the clever bods responsible for the blistering arcade street racer Burnout Paradise. Whilst Hot Pursuit is a comparatively clinical foray into cops ‘n’ robbers racing, it’s still likely the best Need For Speed there’s ever been. The fictitious Seacrest County is the setting that’s mapped out for the player in the beginning as you’re handed a range of challenges to undertake, either as a cop or a racer. 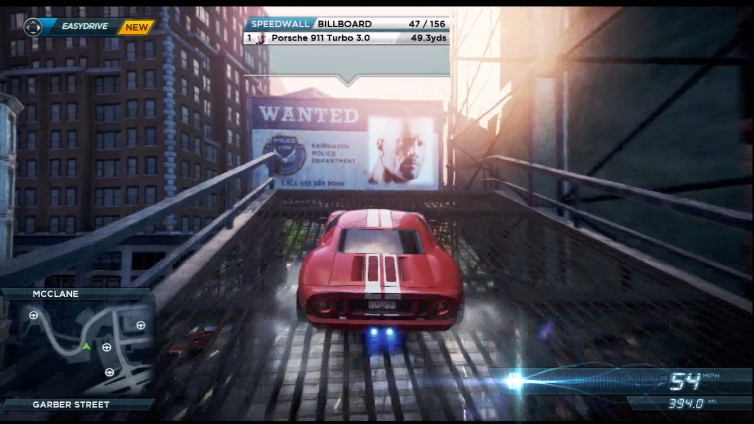 The influence Burnout Paradise has had on the game is an instant and very obvious positive. Skilled or on-the-limit driving is rewarded through the filling of a nitrous bar; heading into oncoming traffic, executing powerslides and utilising shortcuts are all means of topping up your boost. The line between success and failure is tantalisingly thin, but the more risks you take, the faster you can go. Hot Pursuit opts for a structured approach to its racing, using fixed routes with few deviations as opposed to an open-world where drivers pick their own route to the destination. At first, it struggles to emulate Paradise’s swagger and excitement; the canyon passes, long desert roads and coastal runs feel reserved and sparse next to aforementioned title’s bustling cityscape. The handling initially seems a touch heavy, not as instinctive, and the action somehow less busy. ...Cause 4 busts are just never enough! Yet things get markedly better with extended play, and by the time you reach the exotic car classes, there’s little question that when it comes to blazing down the freeways in the blurry night-time, slipstreaming and weaving in and out of traffic, it’s right up there with the best racers in terms of excitement and adrenalin. Car control, which feels a little ill-suited to arcade racing to begin with, soon becomes second nature, and the weight of direction change and the wickedly enjoyable powerslides soon come to be appreciated. Furthermore, Hot Pursuit really shows off with its weather effects; rain reduces grip levels and acceleration just enough to make you feel like you’re walking a tight rope when approaching corners and traffic at speed. Driving a Lamborghini at 160mph in the night with limited visibility and battering rain is an immense experience, and particularly satisfying if you manage to master the conditions. 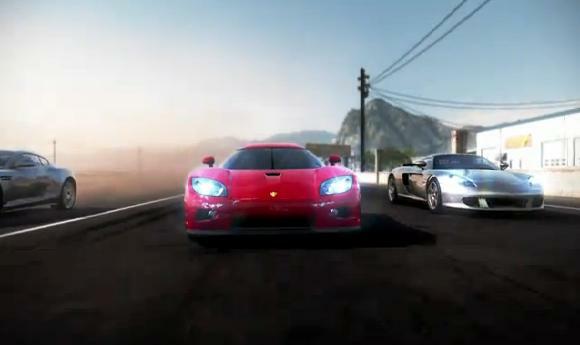 The gameplay is further complimented by some superb weapons and gadgets. No weapon is infallible and there are always ways to use each situation to your advantage – police roadblocks for example can be a nuisance from a racer’s point of view, but should you pick the right spot to nip through whilst dropping a spike strip, it’s an opportunists way of turning the situation to your advantage and taking care of your pursuers. There’s a nice sense of balance and counter-balance to the equipment; police can use EMPs to wreak havoc with racers electrics, or send helicopters up the road to scout their progress, but equally racers can use jammers to prevent such measures and, by temporarily knocking the cops’ radar offline, it gives you the opportunity to flee or shake your tail before they’ve recovered their bearings. Whilst the route layouts and scenic designs are perhaps a touch conservative, there’s no denying the game is exceptionally pretty. The incredible speed, fluidity and dynamism it sports at crazy speeds is something of an art form. The vehicles themselves include a glamorous array of real-life manufacturers including Porsche, Lamborghini and Shelby, and it even throws in the world-beating Bugatti Veyron for good measure. All look sumptuous and impossibly glossy, and also make full use of some bruising crash damage effects. The damage parameters themselves could have been a bit better; it’s easy to cause damage by ramming an opponent from behind, but side-swipe collisions seem rather more of a grey area, as sometimes slamming a racer into the railings has no effect at all. 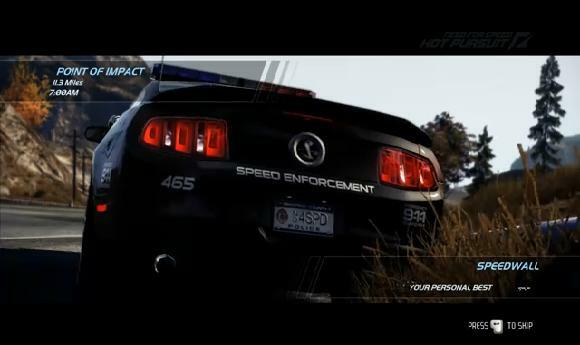 It also has a habit of cutting away to brief cinematics mid-race to show resultant crashes or the deployment of police officers and this can be a peril, especially when it you’re made to rejoin the action halfway around a corner or heading into oncoming traffic. For what it is, it’s a heck of a lot of fun to play with others too. The online structure leaves a little to be desired however; it’s a shame there wasn’t a more detailed set of leaderboards or a stronger emphasis on structured progression, because though the racing itself is highly addictive, it’s ultimately more geared towards holding your interest for a few days than a few months. 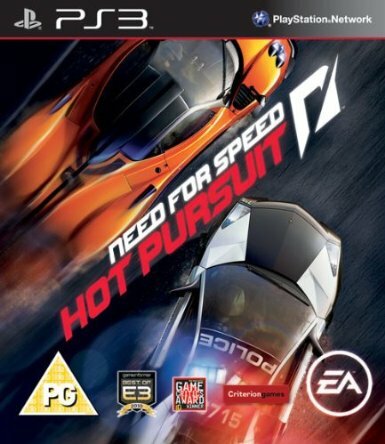 ‘Hot Pursuit’, which sees as many as four cops chasing four racers, is an absolute blast whatever side you are on, whilst ‘Race’ does pretty much what it says on the tin and is competitive and enjoyable too. ‘Interceptor’ is a bit of a misfire – a one-vs-one battle across an entirely non-linear route where either the cop wins with a bust or the racer does by escaping. It’s hard to derive any significant enjoyment from this, as they often descend into clumsy scraps that see the racer doubling back on the route in an attempt to disorientate their opponent. For those who’d rather tackle it alone, a stern challenge awaits that’ll keep you grafting away for a good while, in part thanks to the smart level-up system for the police/racer disciplines. Points are accumulated through strong performances, personal-best times and also for beating friends’ records. They in turn lead to a steady stream of new cars, events and equipment upgrades, though it is a little odd that, given that there are twenty levels to scale, the goodies abruptly stop at Level 13. Still, just as online, the ‘Hot Pursuits’ will provide you with the most enjoyment, whilst the ‘Rapid Response’ and ‘Preview’ disciplines may divide opinion. They make for an absorbingly stern challenge, even if these time-trial styled events are given a rather bigger role than was really necessary. Penalties for clipping traffic or scenery are harsh however, and if you wish to restart (which, if you are aiming for the top awards, will be quite frequently), you’ll be met with some curiously lengthy loading times. Even so, these are small gripes. 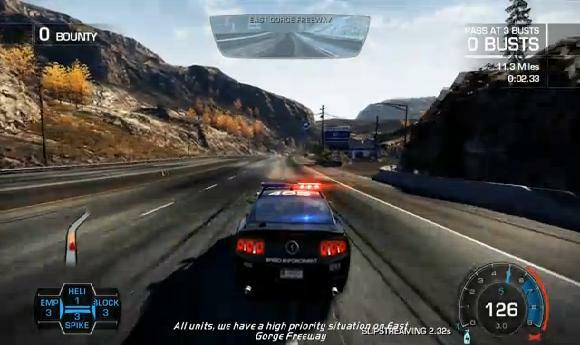 Need For Speed: Hot Pursuit is a class act, all told. Graphics and gameplay tick the right boxes. It gradually builds from an innocuous start, exploding into a hi-octane, supercharged racer of considerable technical quality that, at its best, is quite thrilling to play. The settings may feel a touch anonymous in the final reckoning, but the action-packed gameplay more than makes up for that, and if you’re in any way interested in the racing genre, this has to be worth seeking out.